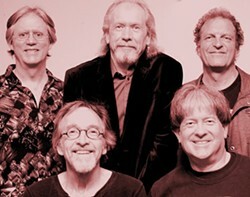 The Backstreet Band has been performing in the Humboldt county area since 1979. The current lineup of players includes founding members Jake Schultz (guitar and vocals) and Russ Bleything (bass guitar), as well as long-time drummer and vocalist Roger Peters. Performing with them since 2012 is keyboardist/vocalist Steve Smith and new member Rick Copeland on lead guitar, sax and vocals. With four vocalists, two guitarists, sax, keyboards, and a tight rhythm section, the Backstreet Band performs outstanding rock-and-roll.